The 13th International Exhibition on Textile Industry (ShanghaiTex 2007) was successfully held on June 1-4, filling 100,000 square meters of exhibit space at the Shanghai New International Expo Center (SNIEC), with more than 1,400 exhibitors from 20 countries and regions showing their products, technologies and services to 49,348 visitors from 40 countries and regions. Suntech won orders of 02 sets of Automatic Fabric Roll Packing System from her Sri Lankan & Indonesian customer and 10 sets of ST-WFIM-180 Fabric Inspection Machines from her Pakistani & Indian customers on the spot. 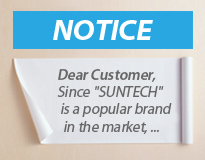 Suntech’s Automatic Fabric Roll Packing Machine and Fabric Inspection Machine became our most popular machines.